If you’re experiencing tooth pain or sensitivity, or if you feel a hole forming on the surface of a tooth, it is important to get it taken care of before it develops into something more severe. At American Dental Care of Newark, we offer fast and simple dental fillings for patients in Irvington, East Orange, Newark, NJ, and the surrounding cities. Over time, the acids and sugars in the foods and beverages we consume wear away the enamel of our teeth. 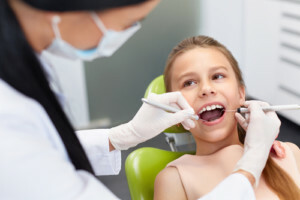 As the tooth decays, cavities form, and if these cavities are not cleaned and filled, it can lead to severe pain and may ultimately require an extraction. This is why your dentist will encourage you to schedule regular dental cleanings, to limit tooth decay and to identify cavities in the earliest stage possible. Dental fillings are a simple way to protect your teeth from decay. If you notice a cavity starting to form, or if you experience pain or sensitivity while eating, drinking, or brushing, give us a call and we’ll repair the affected area quickly and painlessly. Do You Have Tooth Pain or Sensitivity? The signs of a cavity are sometimes obvious, sometimes not. As the tooth decays, less material separates the nerves from the foods and drinks you consume, making them more sensitive to hot or cold temperatures. If you notice increased sensitivity, it can indicate a cavity is forming. If your cavity worsens to the point the nerve is exposed, it will cause severe pain when you eat or drink. If you have severe tooth pain, or any tooth pain, it is critical you schedule a dental visit as the situation will only worsen. If you live in Newark, East Orange, Irvington, NJ, or another nearby town and have noticed tooth pain or sensitivity, give us a call today so we can restore the tooth before you need more involved and more costly dental work. What Happens If You Wait? Cavities will continue to deteriorate the affected teeth if they are not filled. Even with thorough brushing, flossing, and mouth washing, bacteria will re-enter the cavity and wear away the enamel until it reaches the pulp and nerves. When a tooth decays significantly from a cavity, it becomes structurally unstable and can crack or chip, causing severe pain and discomfort. If this happens to you, you’ll probably be experiencing some of the worst pain of your life and will be searching for a dentist that provides emergency dental services like we do at American Dental Care of Newark. Many patients put off their dental visits because the pain is minor enough to manage. While you may be able to tolerate the pain, it doesn’t take away from the fact that your nerves are exposed to bacteria and vulnerable to infection. If you put off your visit to the point of infection, you’ll likely need a root canal, which can take multiple visits and is more costly than a simple filling. Some infections are treatable with a root canal, but some are not. If your cavity goes unchecked for long enough, the tooth will need to be removed. This is not only costly but will permanently leave a gap in your mouth. There are replacement procedures like partial dentures or dental implants, which may require surgery. If you have tooth pain or sensitivity, don’t ignore it. Call us immediately so we can restore the tooth before it causes you any more discomfort. Schedule an appointment now online or call us at 973-453-9088.